The market town of Marlborough in Wiltshire nestles in the Kennet Valley. Enclosed in the stunning scenery of the North Wessex Downs Area of Outstanding Natural Beauty. There is countryside within 10 minutes’ walk of the High Street in almost any direction. Avebury stone circles and the ancient Savernake Forest are on the doorstep. The River Kennet is a fine example of a natural chalk stream and flows just yards from the town centre. It brings with it diverse wildlife with kingfishers, trout, heron, water voles and even otters. There are signs that Marlborough was the earliest centre of human settlement in Britain. The Normans built the keep of a motte-and-bailey castle on a prehistoric mound. The site is now in the grounds of Marlborough College. Legend has it that the Marlborough Mound is the burial place of Merlin, King Arthur’s magician. 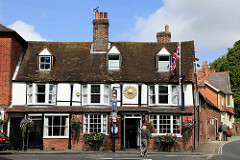 King John gave the town its first Royal Charter in 1204. He granted the town’s status as a market town, and licensed the fairs which continue today. During the Middle Ages and after the Wars of the Roses, the castle fell into ruins. In Tudor times the estate passed into the hands of the Seymours, Henry VIII’s in-laws. The Church ordained Thomas Wolsey making him a priest in Marlborough in 1498. This handsome former staging post has grown into a stylish and cosmopolitan town. The High Street is one of the widest in Europe, with distinctive old buildings on both sides. There is an array of high quality shops and a market on Saturdays and Wednesdays. There is also free community Wi-Fi across the town centre.